This Lucasfilm licensed "The Force Awakens" mixed media original acrylic painting on illustration board, was painted for Star Wars Celebration Europe 2016. 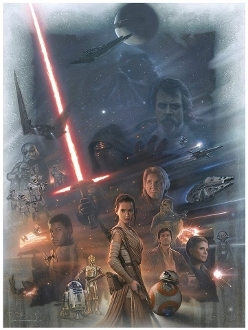 This painting was used for Star Wars Celebration Europe 2016, to reproduce exclusive art prints, of an edition size of 250 lithographs. - reproductions are available in our store/NO reproduction rights granted to buyer of this art. - International shipment - customer is responsible for any customs, or import fees that may apply. - feel free to make any reasonable offer, by contacting us though the store, or at dutchart@sbcglobal.net .